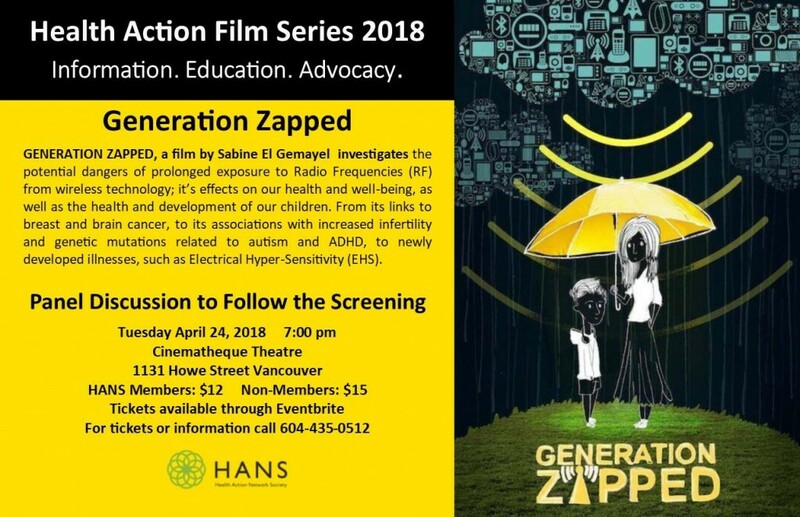 Health Action Network Society (HANS) will be presenting the film “Generation Zapped” to be shown on Tuesday, April 24th 2018 in Vancouver. There will be a panel discussion afterwards, and time for questions from the audience. Bring a friend who is new to the subject. 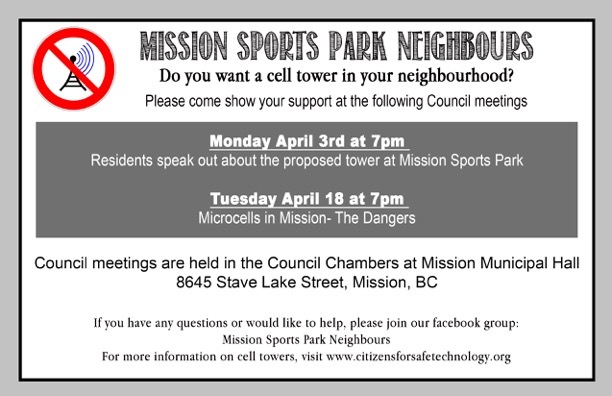 SALT SPRING, March 16 – Microcells, or small cells, are being installed on utility poles in neighbourhoods across BC and Alberta. 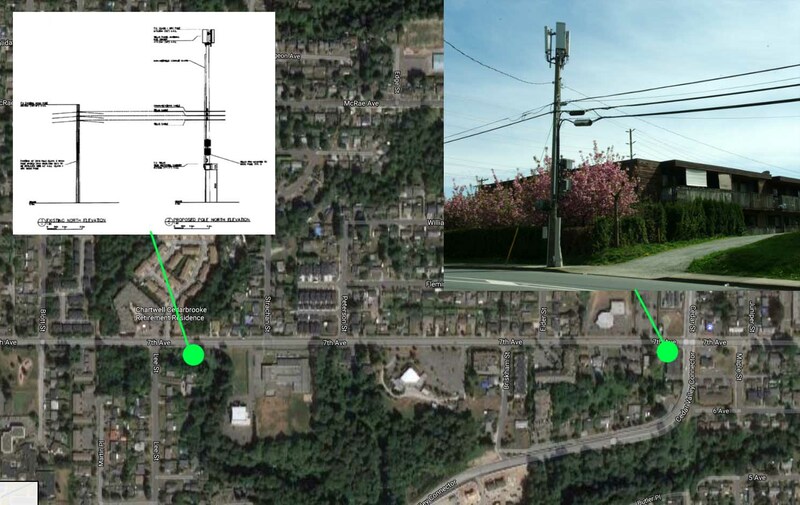 At noon on Thursday, March 23, I will make a presentation: “Small Cells and a Wireless World – the Right to Choose” at the Salt Spring Local Island Trust meeting. The meeting will be held at Hart Bradley Hall at 103 Bonnet Ave on Salt Spring Island. I invite you to attend. Small cells are the forerunner to 5G, the Internet of Things, and the end of landlines. While telecommunication companies and government provide seemingly convincing reassurances of the safety of wireless technologies, if you take a closer look you’ll see that no actual proof of their safety exists.There are safe ways of sharing high speed data, however, but industry must be urged by consumers and regulators to develop them. Research shows wireless technologies may have a major impact on health, trees, pollinators, and even global climate change. Tens of thousands of peer-reviewed scientific studies support adopting the precautionary principal before allowing small cells to become permanent fixtures in our communities and our lives. For a quick, accessible introduction to this subject, please enjoy Cellular Deception, a music video I created last December. Although concerns about the effects of wireless technologies and EMF have recently made headlines in Maryland, Massachusetts, Paris, France and Romania, government and media here at home remain silent on what may very well be the most pressing issue of our time. This report which I just submitted to the Islands Trust explains why. 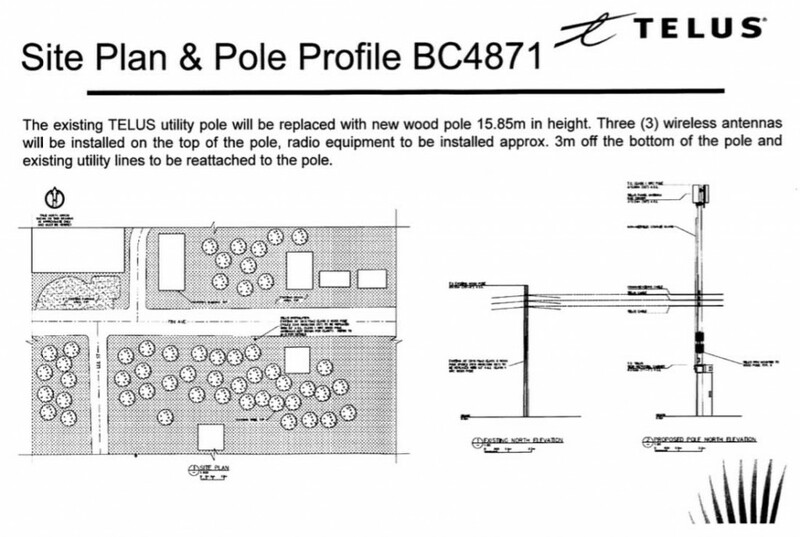 Innovation, Science, and Economic Development Canada (formerly Industry Canada) allow wireless transmitters to be mounted on existing structures like utility poles without public consultation, but municipalities like Grand Forks are demanding a say in the placement of microcells in their communities.The Grand Forks Council recently unanimously passed a resolution to that effect, which will be presented to other federations of local governments for their approval. Smart Meter EVENTS – Click Here! All day event. Includes lunch. Bring a health professional and get $30 off admission! Hooked on Wireless Technology Are these gadgets harming us and getting out of control? IOOF Hall, 9536 Main St. Summerland, B.C. When burgeoning alluring technology, health risks, vested interests and concerned scientists collide, things can get confusing. 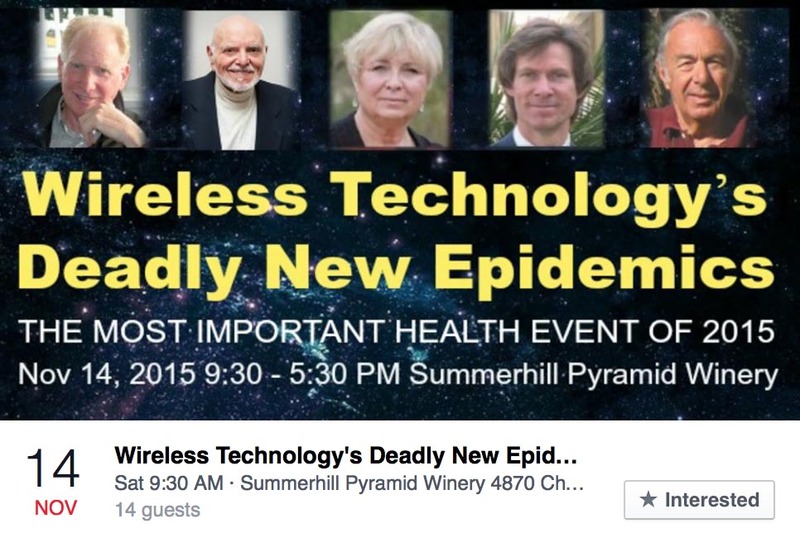 Epidemiologist Dr. Davis presents the current science and strategies in current debates regarding wireless radiation. Don’t miss this important event hosted by the University of Ottawa. The Electromagnetic Age – A Sleeping Giant?? Alzheimer’s, sleep disturbances, cognitive disorders, dementia, male infertility, immune dysfunction, brain tumors, childhood learning impairments – all linked by scientific studies to Electromagnetic Fields (EMFs). The World Health Organization has classified EMF producing wireless devices as possibly cancer-causing. Dr. Malcolm Paterson, PhD, whose career in cancer research spanned over 40 years on 3 continents, will review the health-related science of wireless devices including mobile phones, WiFi in schools and smart meters. Learn the science-based facts and what you can do to protect your and your family’s health. Mark your calendar – we are bringing you an evening presentation that you will not want to miss! We look forward to seeing you at 7pm, Thursday, April 2, 2015 at the Florence Filberg Center, Rotary Hall (Downstairs), Courtenay BC. CV Electro Health Awareness is pleased to be hosting an important information evening featuring Jerry Flynn, a retired Electronic Warfare (EW) and signals intelligence (SIGINT) expert. Mr. Flynn has been working tirelessly for almost six years to educate people on the very real and insidious dangers of wireless technology, especially Smart Meters, which he describes as the quintessential Trojan horse. Mr. Flynn is rapidly becoming sought after to present and inform both the public and government institutions with his vast and impeccable knowledge and range of experience. Jerry’s BIO says: He is a retired Canadian Armed Forces Captain who spent 22 of his 26 years in the arcane military fields of Electronic Warfare (EW) and Signals Intelligence (SIGINT). The former included two years in National Defense Headquarters (NDHQ), Ottawa, where he was employed for two years in the Directorate of Electronic Warfare (DEW). Thanks to Canada’s ill-fated experiment with the unification of its three armed forces, he enjoyed the unprecedented opportunity to gain experience in first naval, then army EW operational environments. For this reason, his qualifications in EW were and still are unique in the history of Canada’s military. In army EW, he completed a major NATO army EW officers’ course in Anzio, Italy, and participated in a major NATO army EW field exercise in the Black Forest of Germany. In naval EW, he served operationally in two Canadian warships and worked with mainly U.S. EW naval units In the SIGINT world, he was the Executive Officer (2-i/c) and Operations Officer at one of Canada’s largest and most sensitive radio intelligence-gathering stations where he was personally responsible for some 200-odd specially-trained radio operators and technicians. Throughout his career, Jerry worked closely with the USA’s national intelligence agency, NSA, and to a lesser extent with Britain’s GCHQ. This event is for anyone who has concerns about the effects of electromagnetic radiation (EMR) and electromagnetic frequencies (EMF). The amount of EMR in the environment is increasing at an alarming rate, due in part to the advent of cell phones, cell phone towers, WiFi, and Smart Meters, but is also emitted by cordless phones, baby monitors, microwaves, and any wireless device. Alzheimer’s, sleep disturbances, cognitive disorders, dementia, male infertility, immune dysfunction, brain tumors, childhood learning impairments – these are all linked by scientific studies to EMFs and EMRs. The World Health Organization has classified these frequencies as possible cancer-causing, Class 2B carcinogens, in a group with DDT and lead. Come and learn about the history of RFR, current research on health consequences and why allowable levels in Canada and the US are 10,000 times higher than in some European countries. Find out what other countries and jurisdictions are doing to protect the public, why you should be concerned and what you can do in your own home, local school or community to mitigate the health consequences of living with these electrical frequencies. Brookswood Seniors Centre, 19899 – 36th Avenue, Langley. See details below. Post signs, notify neighbours, safe-proof your meter, know your rights, send in your Registered NO Consent Letter to BC Hydro ASAP – also available in the Shuswap Action Kit at the Salmon Arm Stationary. 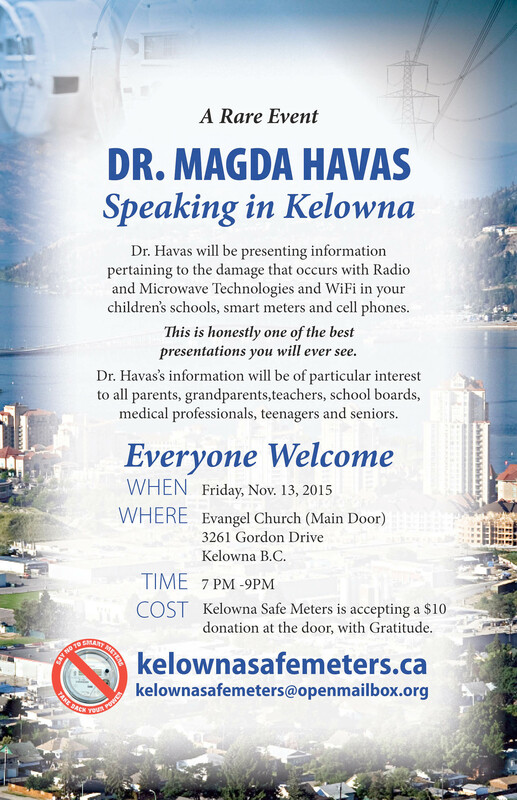 Shuswap “Smart” Meter Awareness Initiatives EVERYONE WELCOME! Monday, August 22, 2011 – 7:00 p.m.
Thursday, July 21, 2011 – 7:30 p.m.
Thursday July 21, 2011 – 11:30 a.m. Event Description : Starting in July 2011, BC Hydro will begin upgrading homes and businesses with new smart meters. The Smart Metering Program is a critical infrastructure upgrade that begins with replacing approximately 1.8 million existing meters with a modern, fully integrated smart metering system. In addition to improving safety and reliability, the Smart Metering Program will lead to enhanced customer service, reduced electricity theft, improved operational efficiency and reduced wasted electricity. Smart meters will also support greater customer choice and control, by enabling customers to use in-home feedback tools when they become available. Join Fiona Taylor, Deputy Chief Project Officer of BC Hydro’s Smart Metering team to learn more about the program, and have your questions answered. Saturday July 16, 2011 – 10:30 a.m.
Saturday July 9, 2011 – 10:30 a.m.
On Saturday, July, 9, we’ll be at the BC Hydro Office, 4400 West Saanich Road in Victoria, from 11 a.m. to 2 p.m. Thank you for your interest in the FortisBC advanced metering project. Individuals interested in learning more about this technology and providing FortisBC with feedback on plans to adopt the technology are invited to drop by any of the planned open houses. 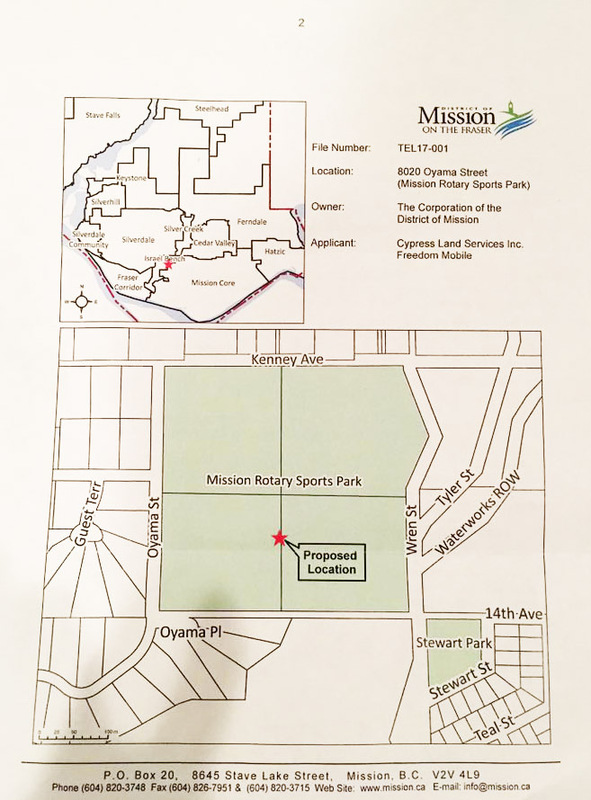 Project information panels will be on display and each session will begin with a presentation 6 p.m.
Osoyoos Wednesday, June 22, 2011 | 6 – 8:30 p.m. Sonora Community Centre, 8505 68 Ave.
Creston Thursday, June 23, 2011 | 6 – 8:30 p.m. CrestonValley Chamber of Commerce, 121 Northwest Blvd. Trail Friday, June 24, 2011 | 6 – 8:30 p.m. Best Western Hotel, 1001 Rossland Ave.
FortisBC at Suite 100, 1975 Springfield Road, Kelowna, BC, V1Y 7V7 Attn: AMI. Victoria and Vancouver were the only ones that involved Smart Meters, all others were cancelled. March 9 from 7 to 9 p.m. at the Ridge Meadows Seniors Centre, Room A. Please post on your Events page. With Gratitude.